In the 18th century this hilly, heavily wooded garden formed part of the grounds of the house which was occupied by the Chairman of the British East India Company, known as Casa Garden, which now houses an art gallery, and the Old Protestant Cemetery, filled with walkways, flowering trees, and old headstones marking the graves of merchants, missionaries, and others from foreign lands who made their home in Macao. 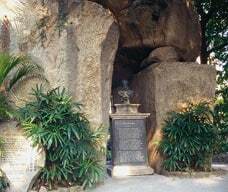 In 1835 the British moved out and the Portuguese owner had a grotto built around a bust of Portugal's national poet, Luís de Camões.The present bronze bust was installed in 1886 when the grotto became state property. 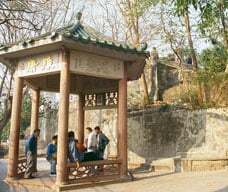 Behind the grotto, paths lead up to a wooded hill with a Chinese pavilion and stone tables and stools, where local men gather to play Chinese chess. 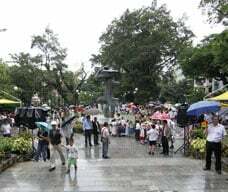 In front of the grotto is a spacious garden, with benches shaded by banyan trees, where people bring their caged birds for an outing, do their morning tai chi exercises, or meet with friends. At the entrance of the garden is a fountain that contains a bronze sculpture entitled "Embrace", specially made to symbolize the centuries' old friendship between Portugal and China.